GE14 ROUND-UP: What now for MCA, MIC and Gerakan? This article first appeared in The Edge Financial Daily, on May 21, 2018. The 14th general election has changed the country’s political landscape in a number of notable ways, one of which is the communal voting pattern that had helped keep Barisan Nasional in power for six decades. Ethnic minority parties in BN were almost wiped out on May 9. MCA’s representation in parliament was reduced from seven to just one, MIC’s was halved from four to two, while Gerakan lost even the two seats it previously held. In contrast, Umno still managed to bag 47 seats despite a significant swing in Malay votes to Pakatan Rakyat and PAS. GE14 may have sounded the death knell for the long-established MCA, MIC and Gerakan, according to some political observers. In fact, the signs of their decline have been evident since GE12, when BN lost its two-thirds majority in parliament. Penang Institute political analyst Wong Chin Huat thinks the three parties are doomed. “Their function was really as communal representatives in the government and to provide minority support for BN as a whole. This arrangement benefited them up to 1999,” he says. “It was largely a case of buying insurance to avoid another May 13,” he says, in reference to the race riots that broke out following the general election in 1969. This rationale became less significant when a riot did not happen after the poor showing by BN in GE12, he adds. It has become even more irrelevant now that Pakatan has built up strong support among all communities. “Lacking a clear ideology, BN’s non-Malay parties cannot function as the opposition. A non-Malay-based opposition would have to be more ideologically based and resilient, like PSM (Parti Sosialis Malaysia),” he tells The Edge. Wong adds that while there is no longer space for non-Malay communal parties, Malay parties can still thrive. He says if Umno is absorbed by Parti Pribumi Bersatu Malaysia (Bersatu) or other Pakatan parties, PAS will emerge as the main opposition force and attract anti-establishment Malay votes. “The best scenario is for Umno/BN to reposition itself on some cross-communal ideology, like becoming left, to compete with Pakatan for Malay votes,” he adds. Will MCA, MIC and Gerakan be able to survive if they leave BN and form their own multiracial party? He, however, points out that Pakatan component parties are also race-based, with Bersatu and Parti Amanah Negara — and to a lesser extent PKR — being Malay Muslim-based and DAP mostly supported by the Chinese. The parties’ appeal to ethnic and religious identity is based on two ideas, says Wong. One is the promise to deliver better representation for the community they represent and the other is the belief that “only their own kind can deliver what they want”. That, says Wong, seems to have subsided now but it can come back if Pakatan fails to convince the people that their interests are protected regardless of their ethnic representation. Syahredzan says GE14 represents a new dawn for Malaysian politics. Not only is there a multi-party democracy, but smaller parties such as PAS and Parti Warisan Sabah have also managed to dislodge Umno. “Democracy is no longer a binary thing where it has to be either Pakatan or BN but we can have a coalition at the federal level, and smaller parties in Sabah and Sarawak and the east coast (of the peninsula) and they need not be friendly parties to the coalition,” he says. “This is very wonderful and exciting because voters now know their rights, and are mature. They know who to send to parliament and who stays in the state. It is a new political dynamism. “And even if Pakatan does not do well in the next election, it has at least broken the BN monopoly, giving rise to a multi-party control of the state and federal legislatures,” Syahredzan adds. This ought to keep the political parties in check for change could just be around the corner. 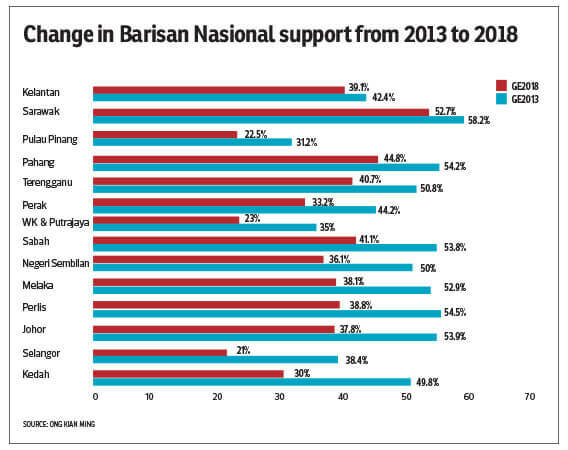 Despite what the political observers are saying, BN’s non-Malay parties do not see a change in their roles. MIC president Datuk Seri Dr S Subramaniam says the ethnic Indian party is still relevant despite being “swept by a national tsunami that was propelled by a strong anti-BN sentiment across the nation”. “Our candidates lost not because of their performance but due to the perception that people have of the parties they represent,” he says when contacted. “There was an evident hunger among the people to change the government. They had tried it before but failed. Subramaniam, however, says MIC needs to move forward and reinvent itself to face a new reality that it is no longer in the government. “Being in opposition is a new culture. We have to adopt new skills to survive as an opposition — so the next five years will be challenging — while trying to retain our members and giving them a new hope,” he adds. Datuk Dr Richard Leete notes that people across the country who had for generations voted BN created history by switching their allegiance because of a deep yearning for change, and rejection of authoritarianism and racial politics. Leete is a former United Nations resident coordinator and UN Development Programme representative for Malaysia, Singapore and Brunei. BN’s share of voters collapsed across all states to just one third overall compared with 47.4% in 2013, adds Leete, who is also a director of the Economic History of Malaya project under Perak Sultan Nazrin Shah. “BN, formed out of a three-party ethnic-based alliance before the elections for the 1955 Federal Legislative Council in a marriage of convenience to solidify the segmented racial society that evolved during British colonial times, appears to be heading for dissolution. It has lost the hearts and minds of the people, and the soul of the nation,” he says. According toProf Datuk Dr Abdul Halim Sidek, BN did not do well in this election because it depended on recycled politicians instead of bringing in young blood. “They brought back candidates from the grave, so to speak, to stand. In contrast, look at Pakatan. They won because they have young people, and more women. It shows voters want change, they are not looking at seniority, “says Abdul Halim, who is secretary of the National Council of Professors’ Politics, Security and International Affairs Cluster. Many of these leaders stayed away from party work after their poor showing in the 2013 election, and only returned to active participation when there was talk of a new election. For example, Penang BN and Gerakan chief Teng Chang Yeow had hung up his battle gear after Gerakan lost all the seats it contested in the state in 2013 to focus on his business and family. However, he jumped back into the ring in GE14 to try to convince local voters to support his coalition by leveraging environmental issues. In a telephone conversation after the election results were announced, a dejected Teng told The Edge he will not be returning to the political scene, contending that Pakatan is too strong. “Enough is enough, I cannot do this again,” said Teng, who lost to DAP’s Zairil Khir Johari for the Tanjung Bungah state seat. Teng polled 3,902 votes compared with Zairil’s 13,245. “In every battle, there can only be one winner. We gave our best but we accept the loss. For me, it is time to retire from politics for good,” added the 54-year-old. The question is should his party, as well as MCA and MIC, also retire for good?